A special Thank you to Cedar Fort Publishing and NetGalley for sending me this book to review. I have so many things going through my brain right now with this book I almost want to re-read it before I write my review. I just might. Uneasy Fortunes is set in one of my very favorite time periods and places. The wild west and late 1800's. Think, Dr. Quinn Medicine Woman time period. Don't laugh, I love that show. There is something that really speaks to me about this setting. I'm always in awe of the trials the women had to bear as well as all the hard work that goes into keeping up a farm or ranch. I love everything about it. I love the cover. It really shows what this book is about. Pete and June have both had a troubled past. They have literally been beaten down and have risen from the ashes. Pete is my favorite character. He is quiet, reserved, hard working and loving. Not to mention he's got the muscles and body of a man who does manual labor for a living. What's not to like about that?! Oh, and he's patient. Very very patient. At times, he's too patient!! The story has a lot of flashbacks. I'm not really a fan of lengthy flashbacks. There were points when I was really getting into the story and then we were taken into a long flashback. I really didn't want to go back 4,5,6 yrs. I wanted to keep going forward. I thought the story could have been told with not so much info in there. You'll get the point across without so much back info on the characters. The flashbacks did hold pertinent information for the present story though. You learn why the June and Pete are the way they are. It's for character development purposes. I was really pulling for Pete and June. I wanted them to be together. I really wanted them to be happy and finally overcome everything they had been through separately and start a new life together. It was just the waiting game. Come on guys!! Get together already!! There is an Epilogue. It felt a little trite. Is that bad to say? I didn't feel it was needed, and it didn't leave room for another book. Not that all books need a sequel, I actually love stand alone books, but this book could have warranted a sequel--maybe. I know I'd enjoy more of Pete and June's story! Overall, great story. The character development is good and I fell more in love with Pete on every page. I'm pretty sure he'll be in my dreams tonight. 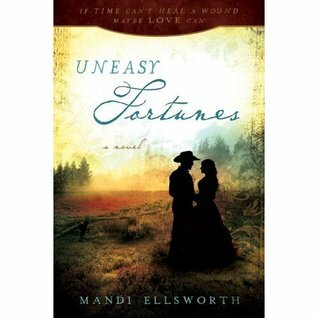 If you've not read a Historical Romance with a western feel to it, then you should pick up Uneasy Fortunes. You'll fall in love with the time period and Pete! Jac, I thought the flashbacks were a little long and maybe could have all been done at the beginning of the story. Maybe chronologically? But it is a great story and I really love the time period. Now, I Want to pick this book up again and re-read it.